It’s a scaffold. It’s a workbench. It’s everything you need for a job well done! Midwest Tool has introduced the Portable Work Surface (PWS) that can be easily transported and set up in any work space. 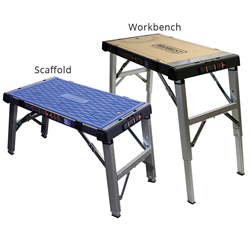 The PWS has two height positions that enable it to be used as scaffolding in the lower position (21.6 inches) and as a worktable in the upper position (31.25 inches). The PWS has a built-in power strip with a three-port electrical outlet and weighs just 30 pounds. 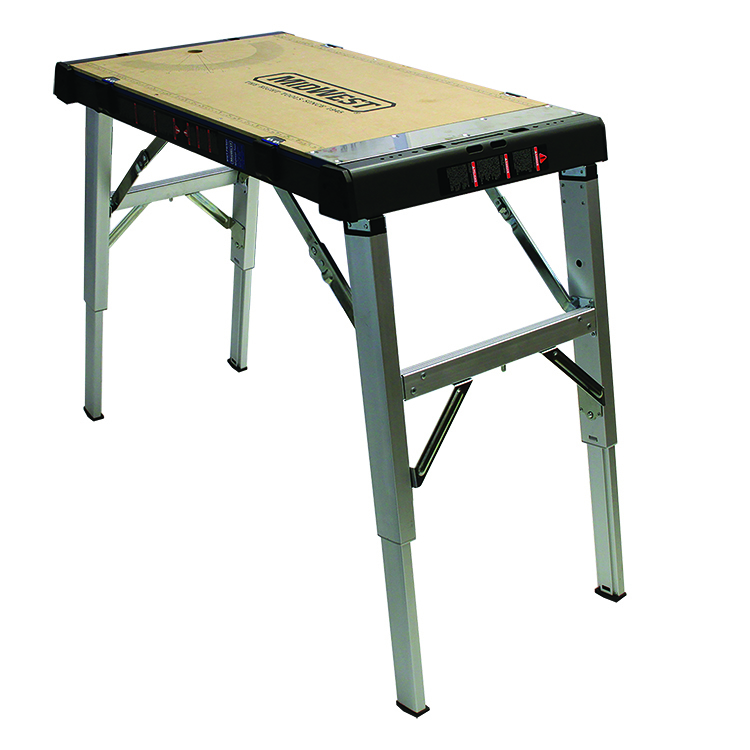 The adjustability minimizes the strain of working on flimsy makeshift tables or constantly kneeling on the ground, and its reversible work surface gives it a wide range of applications. Four clamps on the edge of the PWS allows a person to switch out the work surface based on the specific needs of the job. 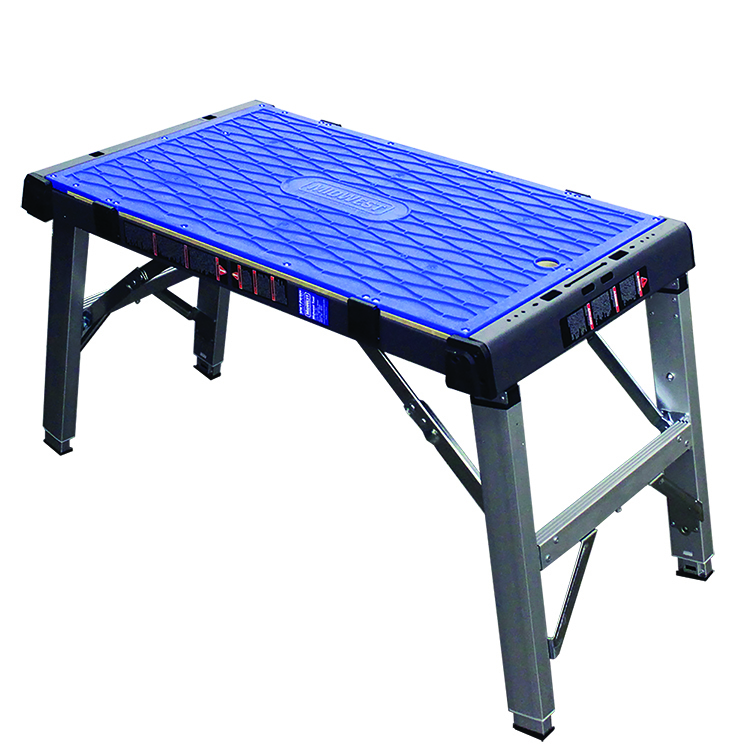 When used in the scaffolding position, the blue work surface offers traction and a safe surface to stand on. When using as a workbench or table, simply undo the clamps and reverse for a durable, wood work surface with handy measurements. The work surface area is 33.5 inches by 18.6 inches, providing ample work space while still being a convenient size for storage. The PWS is ideal for use in HVAC, industrial and building projects including roofing and siding and drywall. However, its customizable engineering and ease of use make it a quality tool that can be used in any professional job. Midwest Tool and Cutlery Company began manufacturing metal cutting snips and related hand tools in Sturgis, Michigan, in 1945. Today, Midwest Tool is a privately-held Michigan corporation that operates manufacturing facilities in Sturgis and Kalkaska, Michigan, as well as Caledonia, Ohio. Attached are two images. One is in the scaffold position. The other is in the workbench position. A demonstration video and more information can be seen at http://www.midwestsnips.com/worksurface. Midwest Snips can also be reached by calling 800-782-4659. Click here to purchase online.